Are you missing armitage on kali linux ? Do you want to run it on Kali Linux , then follow this tutorial. You find how to install armitage on ' KALI LINUX '. 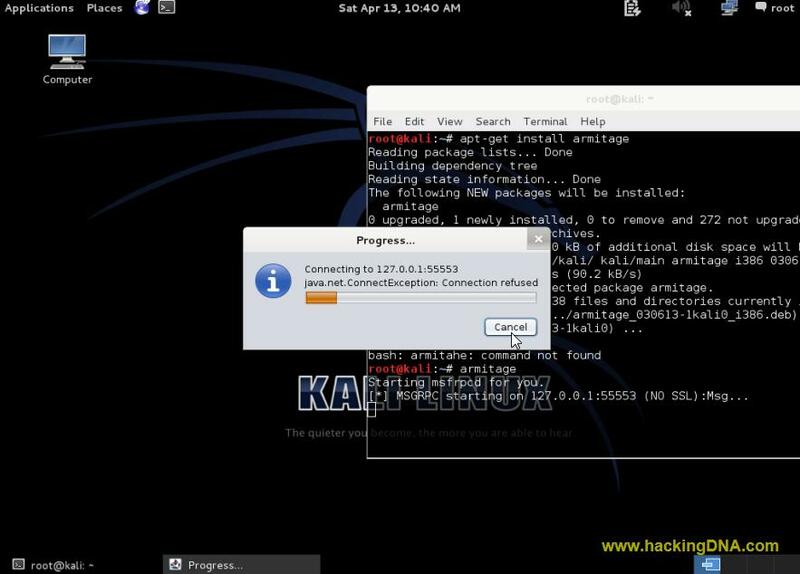 At the end you will find the problems that i face during the installation of armitage on Kali Linux with its solution . I have also posted the error images with its solution images in this tutorial to help you all . THIS IS HOW YOU CAN INSTALL ARMITAGE ON KALI LINUX . It is look so simple right guys . Ohh but wait . Don't forgot to see the below images related to problems . SOLUTION : Update your repositories using apt-get update command . "Could not connect to database I can not find a databas.yml file. I *really* need it.﻿ Try setting MSF_DATABASE_CONFIG to a file that exists." Armitage is already preinstalled on Kali Linux. I then try the apt-get install armitage command it says it cannot locate packet armitage. Help would be much appreciated.